Migisi came from Claire County, MI after having fallen from her nest at about six weeks of age. She was treated at MSU for a fractured leg but unfortunately developed bumblefoot and became imprinted on humans. She was transferred to Nature’s Nursery for rehabilitation but due to the damage her leg sustained and imprinting, she was unable to be released to the wild. In November 2006, Migisi was transferred to the Medina Raptor Center where she eventually found her permanent home in September 2007. She has became one of our most admired and requested educational ambassadors who brings joy to servicemen, veterans, children and adults when she is presented at our programs. 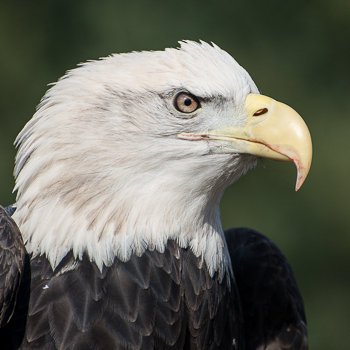 The national emblem of the United States, the Bald Eagle was threatened with extinction in the lower 48 states because of DDT (a type of pesticide) poisoning. Protection under the Endangered Species Act, together with reintroduction programs, brought populations up, and the species was reclassified as Threatened in 1995. By 1999, some were suggesting removing the eagle from the Endangered Species List. Adults unmistakable with brown body and white head and tail. Long broad wings held flat while soaring. Adult with body evenly dark brown. Long hooked bill yellow, cere yellow. Tail moderately long, slightly wedge-shaped. Immatures variably dark with white scattered throughout plumage. Immature variably patterned with dark brown and white; takes five years to acquire full adult plumage. White not restricted to well defined areas, but appearing scattered throughout body, usually with brown mottling in same area. White in wings primarily in linings and not flight feathers. Bill and cere blackish gray. Eyes dark brown. Feet and lower legs yellow. Opportunistic feeder, but prefers fish. Eats large birds, mammals, and carrion. Breeds near water from Alaska throughout Canada and in scattered localities in nearly all of the United States. Also a small number in Mexico. Breeds in forested areas near large bodies of water. Winters in coastal areas, along large rivers, and large unfrozen lakes. Gets food by direct capture, scavenging, and stealing prey from other eagles or other birds and mammals. Will wade in water to catch fish.